Back before it became the Brett Favre's member–wielding juggernaut it has become today, Deadspin, back in the summer of 2005, was just an imaginary site with no name — it was almost called Benchrider.com — on which I planned on writing about ESPN exhaustion, Ron Mexico, and how I secretly still loved the 1998 home-run chase. Charged with starting a sports blog for Gawker Media despite never actually having run a blog before, I looked for tips by sifting through the disorganized smattering of sports blogs that already existed, from Jamie Mottram's AOL Sportsbloggers Live to Sportsfrog to Gerard Cosloy's Can't Stop the Bleeding. They were all good, but the one that blew me away was FreeDarko. Nothing got me more excited about how the Internet might be able to change the world of sports than FreeDarko did. The gang at FreeDarko — which, rather amazingly, is still pretty much intact, more than five years later — were like the overcaffeinated, overeducated philosophy grad students who decided they could learn a lot more from NBA LeaguePass than from their professors. They saw Nietzsche in Zach Randolph, John Coltrane in the triangle offense, Moses in Moses Malone. They wrote with confidence but also with bemusement, as if they were just kind of free-associating until they stumbled across something profound, almost accidentally. I knew the web could produce a way of thinking about sports that was different than what was out there, but I had no idea it could produce this. Of all potential breakout stars of the early sports-blog era — and I say "early" even though, really, it was only five years ago — I would have never thought FreeDarko would be one of the popular breakthroughs. They were too strange, too cerebral, too challenging: They were almost the Art Bell of NBA commentary, destined for the midnight shift at the station, talking to a fan base that was fiercely devoted but with a definitive ceiling. I was wrong: They've now released two warmly received books, 2008's FreeDarko Presents: The Macrophenomenal Pro Basketball Almanac: Styles, Stats, and Stars in Today's Game — which our own Sam Anderson called the "apotheosis of online basketball overanalysis" — and FreeDarko Presents: The Undisputed Guide to Pro Basketball History, which came out earlier this month. Both the books are great, but it was this last one that made me start to understand that FreeDarko isn't standing outside the mainstream of basketball discussion: It's driving it. What's fascinating about the book — which is primarily written, particularly the historical chapters, by FD leader Bethlehem Shoals — is that it is not nearly as cutesy grad-studenty as the first book, or even the site. The book's essays are far more straight than you might think. There are no Amar'e-as-Hebrew-script asides. 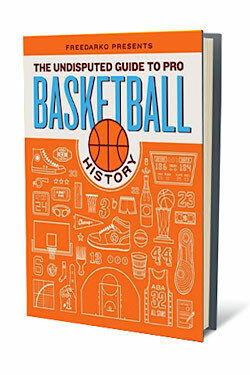 The chapter about Red Auerbach's Celtics is enlightening and oddly moving, but there are no religious allegories or references to ancient philosophers: This is a history of basketball told straight, but smartly, with wit and detail and undeniable affection. Knicks fans will cheer the chapter about the early-seventies championship teams, and Shoals's analogy of Knicks-as–Robert Altman film is inspired. The modern-era essays are sharp and clever without being too much so: I particularly enjoyed Lang Whitaker's reminder of the championship disaster that was 1994's Dream Team II and Shoals's quiet, almost admiring takedown of Shaquille O'Neal. This is, all to say, a fairly mainstream sports book, something I say with as much affection as I can muster. Any NBA fan can read this: It's not for grad students and stoners and revisionists; it's for everyone. Maybe the FreeDarko folks toned down their craziness, but I doubt it. I just think the rest of us finally caught up with them. We are now living in a FreeDarko world. Hail, hail. Tomorrow night, Tuesday, November 30, I will be moderating a discussion of The Undisputed Guide to Pro Basketball with the FreeDarko authors at the Strand, 828 Broadway, at 7 p.m. You are encouraged to attend.